Located in Central Pennsylvania, Alfred’s Victorian has been graciously serving patrons for over forty years..offering deliciously prepared, fresh foods in an elegant setting. 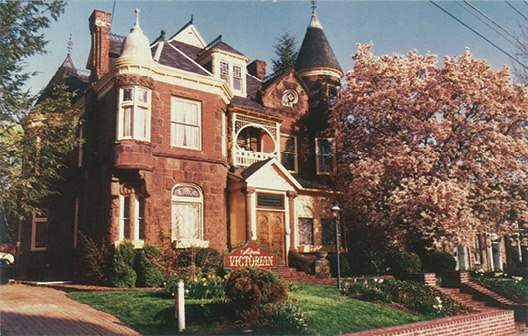 Alfred Pelligrini purchased the late 1800’s brownstone mansion in 1969, with a vision of turning it into a fine dining establishment serving Northern Italian cuisine. A year after making necessary repairs, polishing and cleaning…Alfred’s Victorian open its doors to the public. Wonderful appetizers, entrees and desserts are available..check their website for freshly prepared menu options. Seafood, veal, poultry, beef, freshly made pasta, generous use of fresh herbs from their onsite garden..it doesn’t get much better than this! Alfred’s has won numerous local and national awards.. First Place for Special Occasions, Best Atmosphere, Most Romantic, Best Overall Dining, and the coveted 5 Star Diamond Award among many others. They cater to private parties, special events and offer an afternoon Victorian tea. Tours and bus groups are welcome.